Carl Vine, born in 1954, has become one of the best-known Australian composers of his generation. He first made his name as a composer of ballets, though his catalog now includes six symphonies, four concertos, scores for films and television, chamber music, and some big piano pieces too. His first three symphonies--lush, splendiferous, New Agey creations--were recorded on ABC 426995 (Mar/Apr 1993). They are not quite my cup of tea. This new anthology of five recent chamber pieces is identified as the second of two volumes. (Volume 1, Tall Poppies 13, contains Vine's First Piano Sonata and four other works.) Volume 2 includes two sonatas, a quartet, a piano cycle, and Inner Voices for solo cello accompanied by electronically modified recreations of itself. Like Vine's symphonies (I haven't heard the other chamber program), this is spacious, confident, splashy music that teems with big gestures, energy, and--in the andantes--full-throated, openly romantic tunes. The Second Piano Sonata, at 20 minutes, is the longest piece here. It has a rhapsodic, expansive feel, with lots of textural variety that encompasses roiling arpeggios, plangent bell-sounds, dreamy wisps, and somber, visionary chorales. The music is virtuosic and showy, but not especially modern sounding, and though there are some jazzy and minimalist touches the idiom is also indebted to 19th Century bravura pianism. The Flute Sonata is a more compact and shapely composition, though likewise virtuosic and brilliant. There is much use of whirligig ostinatos cunningly played off against longer, sinuous melodic lines or racing alongside darting figures, and the piece as a whole brims with open-air freshness and youthful vivacity. This nicely crafted piece has a pleasing neoclassic economy and precision, and is the high point of the program; I've listened to it many times, with growing pleasure and admiration. The outer allegros of Vine's Quartet 3 are also powered by uncoiling ostinatos, but here they are more sinewy or jagged. Bartok updated by Philip Glass, perhaps? This quartet's amorous central adagio, in strong contrast, is sumptuously melodic and effusive--even sentimental--in a sort of Tippett-visits-Down-Under mode. There are two shorter works at the end. Five Bagatelles is a 10-minute sequence of sharply-differentiated miniatures that range from just over one minute to just over three. The idiom in these five pieces varies from chromatic expressionism and postmodern ragtime to the triadic serenity given full flower in the final 'Threnody'. Vine's quite extroverted Inner World, on the other hand, defies any category of style or genre. Its electronically-distorted additions transport the solo cello's multi-cultural global village laments, fervent songs, and happily frenzied dances to somewhere in outer space, where enthusiastic gaseous blobs thrum, wheeze, cackle, and twitter along as pale-green, phosphorescent three-eyed aliens gleefully slap their tentacles in time. An increasingly merry time is had by all--even, to my surprise, me. Performances are expert and confident. Sonics--from different dates and venues--are variable: dim and reverberant in the Bagatelles, rather boxy in Inner World, good in the piano sonata and quartet, up-close and realistic in the Flute Sonata. Vine's music, at its best, has an inevitability about it that all good music has: all good art. You feel that it couldn't have come out any other way. His second piano sonata – composed, like the first sonata and the concerto, for Michael Kieran Harvey – and his third string quartet both show a tougher side to Vine… I used to think Vine's first sonata was his best piece. The second sonata is better; the quartet is better still. The excellent performances, of course, do no harm to the music's reputation, but it's Vine who is the star of this CD. The present collection of chamber works gives a good overview of his idiom. In contrast to its outwardly free-form predecessor, the Second Piano Sonata has a well-defined formal structure The Flute Sonata brings a welcome freshness to the fast-slow-(very) fast format, while the willingness to let the flute sing is most marked in the plaintive roulades of the second movement. The work typifies the 'accessible without being simplistic' quality at the heart of Vine';s music of the past decade. The Third String Quartet suggests Vine is familiar with the last of Sir Michael Tippett's five quartets; not in terms of direct stylistic influence but in the space which characterises the translucent quartet textures, pizzicatos effectively absorbed into the motivic writing, the serene, modal lyricism which permeates the central section and the vigorous rhythmic interplay at the close.… Finally, Inner World achieves a union between the solo cello's real and recorded selves with deceptive ease, the textures knitted together with a fluid and sometimes unexpected continuum of ideas.… Excellent performances from soloists familiar with Vine's testing though never unreasonable requirements.… You won't go far wrong with the present release. 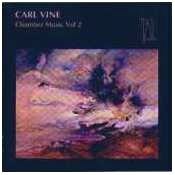 This is the Tall Poppies label’s second volume of Carl Vine’s chamber music. All five works were written during the 1990s, mainly in 1994, and as such represent a more approachable, lyrical music than Vine’s earlier works - the Piano Sonata’s brusque jazz riffs, the Flute Sonata’s dreamy eloquence, the String Quartet’s old world elegiac romance, the moody lyricism of the Bagatelle’s and Inner World’s masterly use of technology. The Piano Sonata No.2 is an invigorating two movement work of contrasts largely between the driving left hand rhythms and the more lyrical, fantasy-like passages called for in the right hand. Such a contrast again makes its mark in the Sonata for Flute and Piano. The Piano Sonata of 1997 is a joy to the ear and superbly executed by Harvey who also recorded Vine’s very well-known First Piano Sonata, which later became a ballet often performed by Graeme Murphy’s Sydney Dance Company. It is at times an intense, occasionally dark work which despite its sense of inner propulsion almost comes to a grinding halt in the first movement’s slow section (at 6"30"), yet the listener is not fooled for at all times you get the feeling that this is simply an interregnum, a moment of contemplation before the principal mood returns which it does. The second movement opens with a fast, driving, syncopated rhythm oveilaid with some right hand tone clusters which punctuate Vine’s poetry lines. The left hand rhythms are allowed to work up to quite a pace and it seems that Harvey at times may have reached the extent of his virtuosity, but then he surprises us by picking up the pace a little more. Again we have fantasy interludes followed by the music grinding to a halt, leaving us with little more than fragments of decoration. Yet Vine rises from this sleep and quickly builds towards a close in which the tonal, rhythmic left hand competes brilliantly with the dissonant right all the way to the works final peroration. Inner World is one of Carl Vine’s most innovative and attractive works, scored for solo cello but taped and overtracked to the extent that it appears that we are enjoying an orchestra of cellos and percussion. Marvellous ideas, strong themes and excellent performance(s) from David Pereira. Some extraordinary bell-like sounds from the famous Stuart & Sons pianos too. This CD is a must for anybody interested in contemporary classical music. Vine is relatively well-known here in Australia, but the music on this CD and other works of his suggest that he should be more widely recognised. The performances of the works on this disc are irreproachable- Michael Kieran Harvey's fiery, passionate and tender performance of the Piano Sonata no.2 is simply breathtaking. His attention to detail is incredible and this performance simply illuminates Vine's wonderful music. A personal favourite of mine is the String Quartet No.3- this piece has it all, excitement in large doses, interesting rhythms and harmonies, but plenty of old-fashioned beautiful tunes as well. Vine is such a versatile composer in that he seems equally at home writing complex, rhythmical music as he does writing beautiful melodies. Both are well represented on this disc! Heartily recommended.